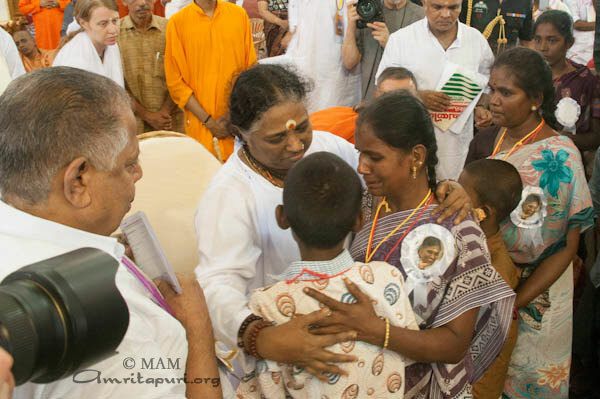 Amma conducted the weddings for 59 impoverished couples. The couples were given new cloths and gold ornaments and food for all family members who attended. This was part of the number of charitable activities launched during the 59th birthday celebrations of Amma. Thiruvanchoor Radhakrishnan, Honorable Minister for Home Affairs, handed over 21 claims settled according to the Amrita Sree Suraksha Insurance Program. The members of AmritaSree & AmritaSREE LIC Surakha project will receive financial assistance (Rs 40,000 in natural death, RS 85,000 in accidental death, Rs 35,000 in partial disability, Rs 75,000 in permanent disability). This was part of the number of charitable activities launched during the 59th birthday celebrations of Amma. During the 59th birthday celebrations of Amma, along with the many charitable projects, AmritaNidhi, free monthly pension program was extended to 3000 more. 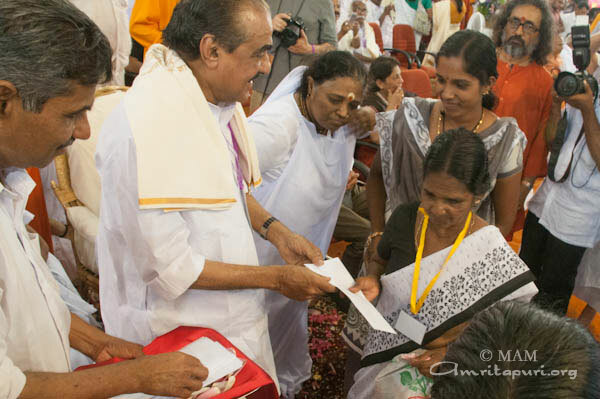 During the 59th birthday celebrations of Amma, along with the many charitable projects, a new phase for AmritaKuteeram, homes-for-the-homeless program, was launched. K.V. Thomas, Central Minister of Consumer Affairs, Food & Public Distribution, inaugurated the new phase in which MAM will construct another 500 houses. MAM has already constructed more than 45,000 such homes throughout India. 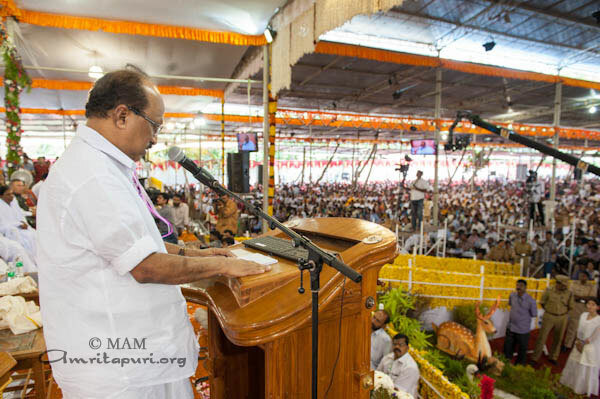 During the 59th birthday celebrations of Amma, along with the many charitable projects, a number of new research-oriented projects of Amrita Vishwa Vidyapeetham were inaugurated. A new program to help school children study material such as physics, chemistry, biology, maths and environmental sciences via multimedia has been developed by Amrita Vishwa Vidyapeetham. These programs will be available in both local languages—totally free of cost. They teach basic lessons in how to protect the environment. This computer program will opens the door of communication between people sitting in any corner of the world. Amrita Vishwa Vidyapeetham has developed this technology, with the aim of helping scientists share and discuss ideas. Amrita will provide this technology free of cost to educational and governmental institutions. Amrita University also announced a program to provide cyber security, free of cost. Retired Supreme Court Justice V.R. 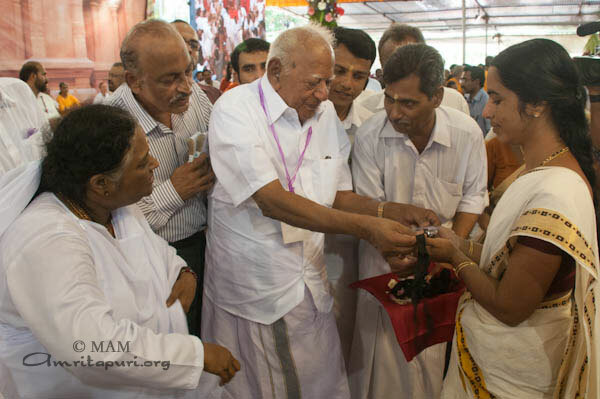 Krishna Iyer inaugurated the Amrita Vocational Training Centre. Upon doing so, he said, “This [Amritapuri] is a sacred land. It’s not enough to give food and clothing. Everyone also wants justice. Amma is working for that justice. Amma is a symbol of universal brotherhood and is God in human form. 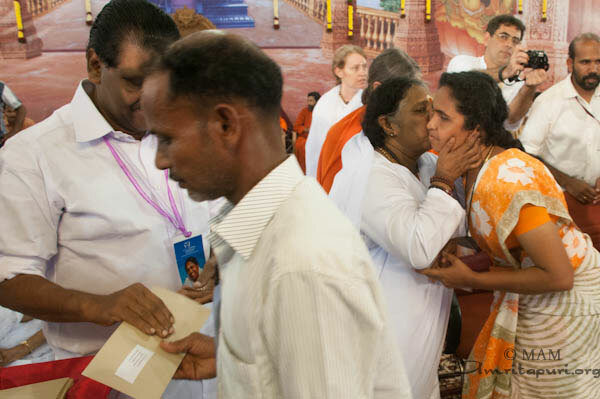 This human ocean of compassion represents this immortal power.” He also said that, wherever there is sorrow, Amma is there to wipe away the tears.” This inauguration was part of the number of charitable activities launched during the 59th birthday celebrations of Amma. Vidyamritam, free educational scholarships-for-the-poor program was expanded from 37,000 to 40,000 beneficiaries. K.C. 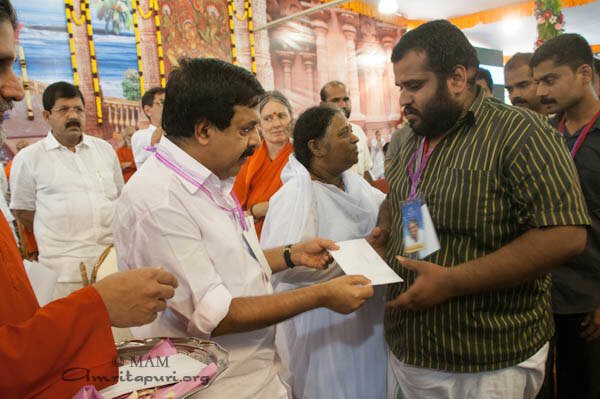 Venugopal, Central Minister of State for Power handed over the cheque to the beneficiaries as part of the number of charitable activities launched during the 59th birthday celebrations of Amma. Aryadan Mohammed, Minister for Power & Transport, inaugurated an Amrita Sahaya Nidhi program, wherein families who lost a member in the Sivakasi fireworks-factory explosion were given Rs. 100,000, and those who were seriously injured received Rs. 50,000. Tamil Nadu MLAs, Sri. Thangatamil Selven and Sri. R.M. Palani Swami, helped distribute the compensations. This was part of the number of charitable activities launched during the 59th birthday celebrations of Amma. During the 59th birthday celebrations of Amma, along with the many charitable projects, one of the main charity projects was extending the charitable care at Amrita Institute of Medical Sciences in Cochin, wherein MAM will provide 200 heart surgeries and 50 kidney transplants for the poor free of cost. Launching this program, His Excellency the Governor of Chattisgarh, Sekhar Dutt said: “It is the need of the hour to help the helpless. The poor will not be able to bear the high expenses of heart surgery and other medical procedures. The services provided by AIMS Hospital are exemplary in this field. During the past 14 years, AIMS has provided impeccable service to society, earning the trust of the people. Here we can see a group of people who are willing to cheerfully offer service to the needy. 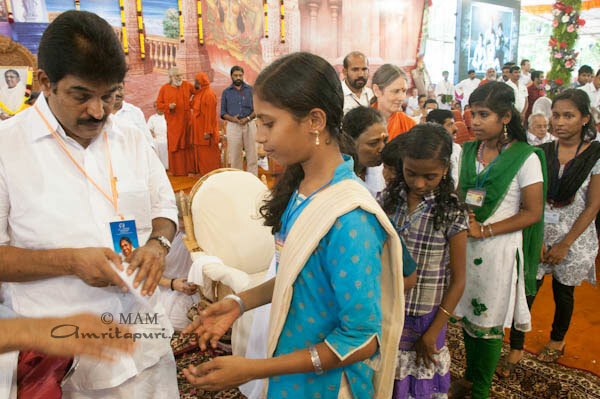 Amma’s method for service is an example for the entire world. She not only encourages people but is providing a role model for society in the fields of health, education and disaster relief. In all these areas its services are commendable. During the 59th birthday celebrations of Amma, along with the many charitable projects, Amrita Nidhi, free monthly pension program was extended to 3000 more, bringing up the total beneficiaries to 48,000.